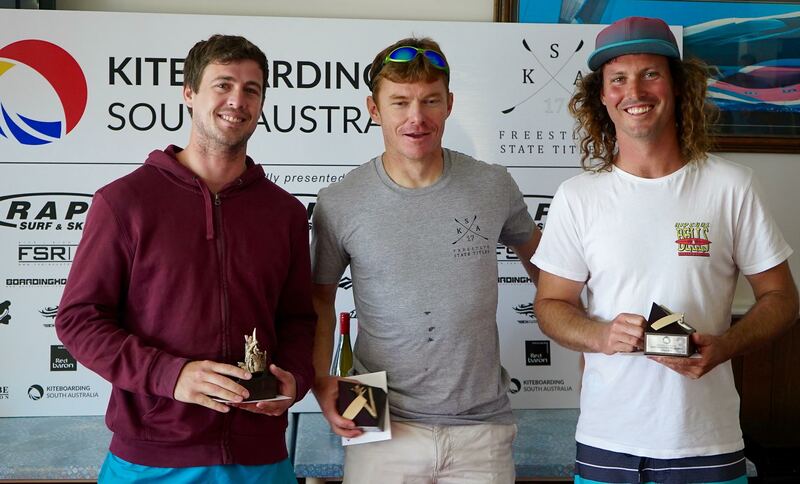 The Kitesurfing SA state titles were held at the Grange Sailing Club recently. 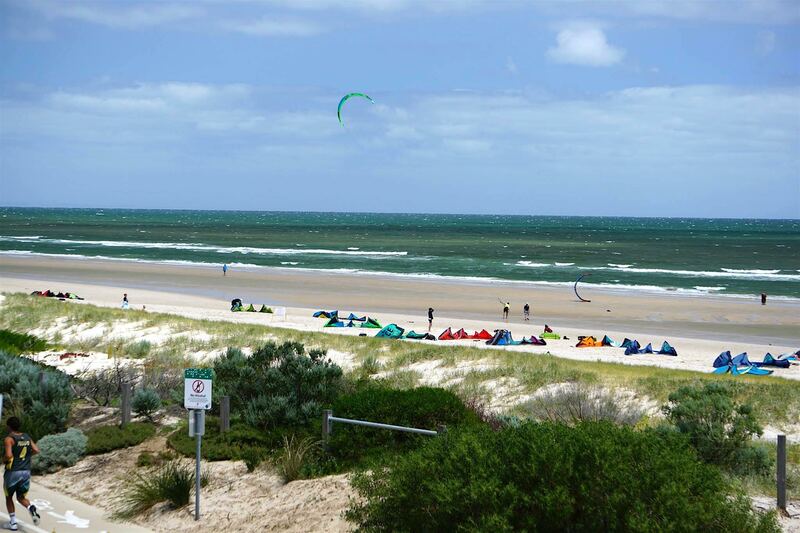 South Australia is the state of kite surfing — so much so that the Kiteboarding South Australia’s (KSA) State Freestyle Titles is one of the country’s premier kiteboarding events. We may be a small part of the country’s total kiteboarding community, but our highly-tuned competitions have been getting noticed by the rest of the country and have been setting benchmarks for other organisations to follow in recent years — 2017 was no exception. Competition zone with heats about to kick off. 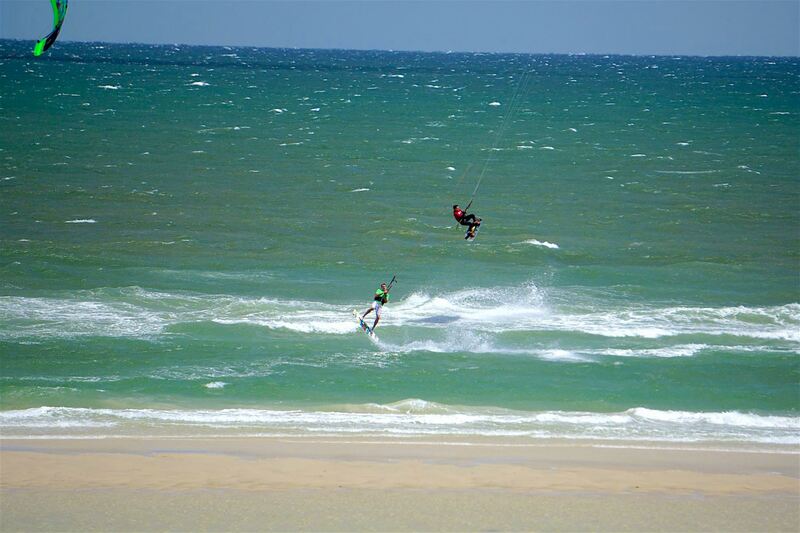 And, with a few highly-skilled kiters returning to competition this year after a few years off, only to find the competition hadn’t let the gap they’d left go unfilled, it was destined to be hotly contested. In the lead up to the competition, the event was postponed due to lack of wind on the first available weekend. However the following weekend, 11th and 12th of February, offered incredible conditions. Saturday competition kicked off as soon as the Surf Life Savers had vacated the water, and we were able to get through most of Round 1 in the Amateur, Masters and Legends division before that famous Adelaide South Easterly put a stop to the day’s action. Martyn Bone and Bastien Fruy getting some air. Returning bright and early on Sunday, competition fired up at 10am where it had left off the day before, and it was as if the sleep had done everyone some real good. The Amateur division, typically setup for the majority of riders, with no unhooked tricks allowed, and also no kite-loops allowed, had magically transformed into a hotly contested division. The level of riders had increased dramatically on previous years, suggesting that if this progression continues, our Open Men division (one of two premier categories) might have to watch their backs in the coming seasons. As the day moved on, the wind only grew stronger and with the tide filling in, the mid day and early afternoon categories made good use of the lagoons filling up on the inside of the sand bar, and the sensational flat water it offered. With only one Junior rider this year – all the others had turned 18 and moved up to Open categories – it was decided to cancel Junior competition and allow young Alec Mascolo go compete in Open Men, affording him a default win in Juniors, and the opportunity to experience a higher level of competition. Open Women’s winners Catherine Tanner, Jacqui Hockaday and Elise Potharst. Our Masters and Legends categories were great to watch, as always, with some of the state’s strongest and longest serving riders now throwing down in these categories. Masters in particular, saw former State Open Men’s Champion, Martyn Bone, come up against some strong competition in the likes of Evan Higham (former Masters freestyle winner and Wave State Titles Open Men’s winner) and plenty of others. The kite-loops were rife and dark-slides were fashionable again. The two premier categories, Open Men and Open Women have traditionally been very tough competitions with the top spot rarely a given, since the days of old when Ben Winding occupied the top step for a good few years. But in 2017, Ben was back after a few years off travelling. Did that mean it was going to be an easy road to victory this year? Nope, certainly not. Whyalla’s flat water King, Jordan Grimes and last years dark-horse Champion, Brant Oxlade had very different ideas on how the podium was going to look. Open Men’s winners Ben Winding, Brand Oxlade and Jordan Grimes. Meanwhile, the Open Women’s competition, which has seen more lead changes in the last few years than a gineapig race at the Royal Adelaide Show, was set to be another nail biter. 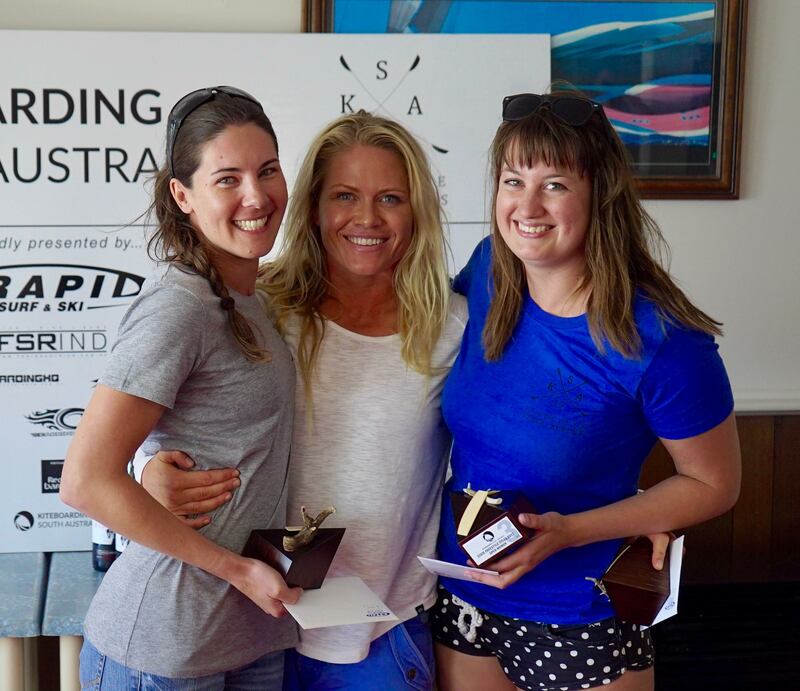 The Queen of water sports in South Australia, Jacqui Hockaday was out to defend her title, but two women had every intention on standing in her way, Cat Tanner (the one woman who’s managed to knock Jacqui off the podium in the past) and KSA Committee member Elise Potharst. Both of these girls possessed the skills to take the top step, with unhooked tricks and the ability to take a stack like few women in the sport. And with Jacqui’s flat water oasis of a training ground, she was going to have her work cut out for her in Adelaide’s choppy conditions, where Cat and Elise ride every day of the week. In the end, it was a fairytale ending for Ben Winding and Cat Tanner. Ben’s return to form saw him land a few key tricks in the final which secured him the win, with Brant Oxlade hot on his heels, followed by Jordan Grimes. Both Brant and Jordan were easily worthy of 2nd place, however Brant’s stylish execution of a few smaller tricks took precedence over Jordan’s more complex tricks that he struggled to pull off in the rough conditions. Cat Tanner edged out Jacqui Hockaday for the top step, flipping the result back over once again, fuelling the rivalry, albeit incredibly friendly and respectful, for next year. Elise’s stellar effort saw her land some of her best tricks and let it be said, she’s absolutely got what it takes to bring it to both Cat and Jacqui in the coming seasons. As always, the winners of all categories went home with another of master craftsman, Evan Higham’s sought after, hand made trophies. Kiteboarding South Australia would love to thank all of the competitors, the hundreds of spectators, and our great sponsors and supporters for once again helping to make the State Freestyle Kiteboarding Titles a roaring success in 2017!